There are four primary types of elevator movement mechanisms: traction, hydraulic, vacuum and climbing. Sensors used in all types of elevator include infrared, level, current, load and hall-effect sensors, limit switches and encoders. Encoders are used to detect motor’s rotation speed so as to control the motion and position of elevator car. Meanwhile, current sensors detect motor’s working current based on which the power of motor could be adjusted to a proper level. Leveling sensors transmits floor number of car to control center in order to activate brake mechanism and make sure elevator stops desired level. Sensors, achieving this, are actually optoelectronic sensors or smart position sensors mounted in elevator shaft or at top of car. Also, some elevators use hall-effect sensors to sense car position. To prevent elevators from running off the rails, limit switches are required to set a highest and a lowest position for car. Infrared sensors are located in car to detect obstacles at doors with purpose to prevent passengers from being caught between doors. In addition, there is a load sensor mounted at the bottom of car to monitor load and initiate the overloading alarm as required. The rapid development of sensor technology will bring more products of different unique capabilities to modern elevators, and is bound to make them more intelligent and environment-friendly in the future. How to make that happen? Just take a look at our CA109 Long Distance Measuring Module and CA111 Wide Temp. 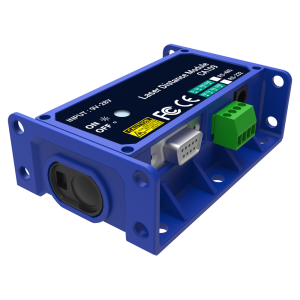 Laser Distance Module. 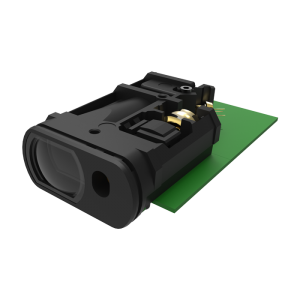 CA109 as a long distance measuring module, it can measure up to 100m with the target board and the repeatability accuracy is +/-2mm. There are 3 protocol output you can choose from: UART, RS232, and RS485. It is perfect for controlling and monitoring elevator level. Imagine a storey is about 3m high and CA109 can detect up to 33 storey level. Click here to see CA109 specification. Built as small size compact module, CA111 could work in a wide temperature range environment from -20°C to 70°C. What’s more? It can measure up to 40m with +/-2mm repeatability accuracy. It is fit for elevator level positioning, surveillance monitor detecting, industrial endoscope, and robot eyes distance measuring. We offer you an affordable price, yet we do not lower the quality! Click here to see CA111 specification.